I love carrot cake, but I kinda hate making it. Why? Because then I know how much oil and calories are in the thing! So I keep trying to reinvent the carrot cake, so I can enjoy it without the guilt…well less anyway. First, I made carrot cake pancakes (twice!) and uh, super delish. Actually, I want to give those another makeover, now that I think about it – with grated carrots instead of pureed. Or would the kids mutiny? Hmmm…more thought is required on that. 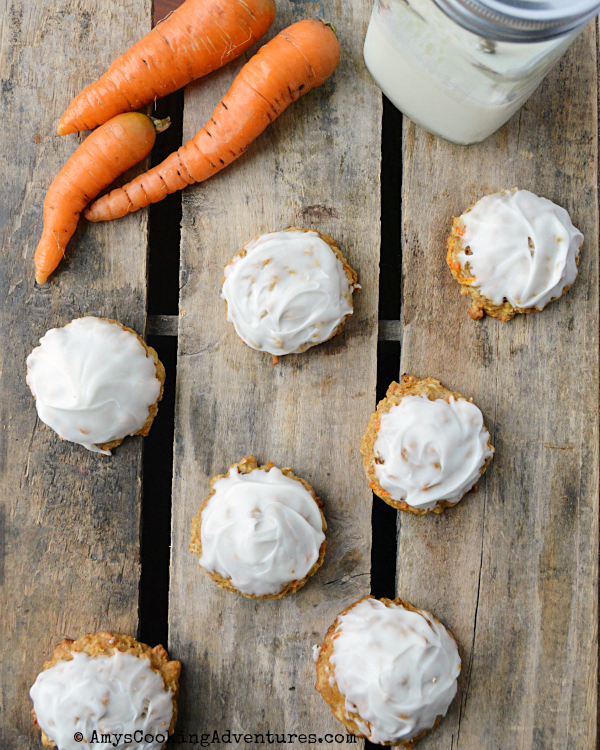 The next (slightly) healthier version of carrot cake is the cookie version. These aren’t greasy (well, any more so than any other cookie), plus there’s oats – those make anything healthy, right? But the real reason these are healthier is portion control. I can’t help myself around carrot cake - I always have a ginormous slice, slathered in cream cheese frosting. Cookies are insta-portion control. I mean, yeah you could eat half the batch, but it’s easier to stop at one. Originally, I made these cookies with a cream cheese glaze, but it turned them into a sticky gooey mess (not in a good way). I really wanted a frosting that could hold up and still be delicious. Paging white chocolate! It’s the perfect solution! The cookies are frosted and still hold up to stacking. Because carrot cake needs frosting. Otherwise it’s just a carrot cookie, and let face it, that’s kinda weird. Place the butter and sugar in the bowl of a mixer and cream together, beating on medium until light and fluffy. Add the egg and sour cream and beat until combined. Turn to low and stir in the baking soda, cinnamon, flour, and salt. Add in the oats and grated carrot and mix until well combined. Use a medium (2 tablespoon) scoop to measure dough balls. Place the cookie dough on the pans, about 2 inches apart. Bake in the preheated oven for 10-12 minutes or until browned. Cool on the pans for a minute or two, then transfer to wire racks to cool completely when stable enough to move. Once cooled, melt the white chocolate. Dips the top of each cookie into the white chocolate. Allow the chocolate to harden, then move to an airtight container to store. 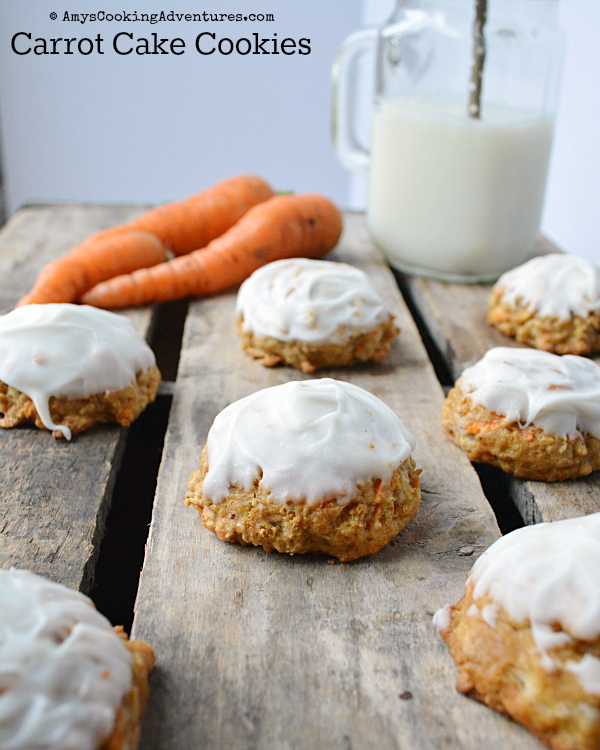 I have made carrot cake cookies and LOVE them. Yours looks like a great recipe Amy.